As more and more people spend their time browsing the web, developing a successful social media strategy to promote your salon is imperative. Here at Salons Direct we are sharing the best ways to turn those people into clients by using social media to market your salon. Many small businesses can become overwhelmed by the thought of marketing their business on social sites. However, this marketing method is a highly effective way of communicating with both your current and potential clients. This can be done all whilst boosting awareness of your services and maintaining your salon’s brand loyalty and community. 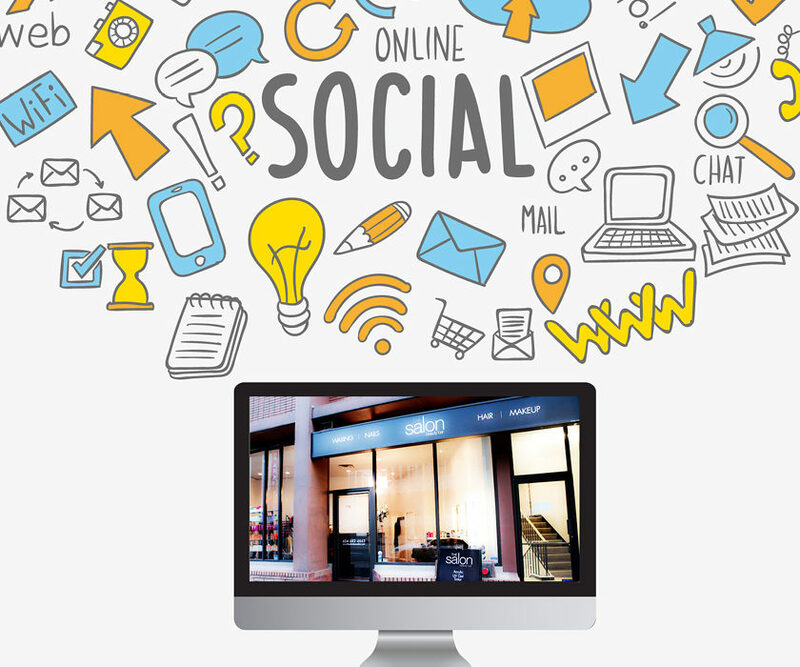 Whether you are operating a marketing strategy across multiple channels such as Instagram, Twitter and Facebook, or choosing to pay attention to just one outlet, it is important that your salon is seen to have an online presence. Consistent online engagement makes your brand appear approachable and well connected with its clients. It also promotes the idea that your salon is forward thinking and wholly accessible. Providing the perfect platform to share your services, post photos of your work or host giveaways, Facebook is a great medium to communicate with clients. There’s no limit on character length (as with Twitter) and there’s more room for factual information than on the image-led Instagram. If you are open to promoting your salon through social media, Facebook is the most effective starting point. Whichever social media platforms you are using, it is important to think about when your clients are most active on them. For example, posting in the middle of a weekday will not be as effective as posting in the early morning, lunch time, evening or weekends when clients have the most time to see your posts, prompting them to give you a call to make an appointment. Before you begin marketing your brand online, take a walk around your salon and immerse yourself in your salon’s unique style and image. Ask yourself, are you a city centre contemporary, artistic salon? Or a more traditional, village salon? Your online tone of voice needs to represent the feel of your salon so it is wise to think carefully about what your target audience and demographic would find appealing. Create a community by posting content that people will engage with. It could be a poll such as: ‘Which is your favourite style of bob?’ or a general engagement question such as ‘Which celebrity has your favourite hair colour?’ You could even go one step further and post more thorough content such as ‘create the look’ guides. These interactive kinds of content pieces will increase social media shares and widen the reach of your brand. Competitions are also beneficial to your salon business as it will broaden the reach of your brand page. We also recommend running promotional offers and discounts on calendar events such as the Christmas party season. Encourage your social media following to ‘Share this picture’ or ‘like this post’ to be entered into a draw to receive a complimentary treatment or a discount. However, make sure you follow the rules for competitions on social media. Facebook, in particular, has quite strict rules about how you can and can’t run competitions. Photos are the key components to a successful social media strategy for your salon business. Your salon should be showcasing and sharing work that you are proud of. Whether that’s a gorgeous bridal updo or a beautiful manicure, pictures are shareable and likeable which make them the perfect lure for bringing in new clients from the personal networks of your existing clientele. Before and after pictures are particularly useful as not only do they showcase the skills of your stylists but also show results to entice clients to book in for a similar transformation. The handy thing about these kind of photos is that they can be used across all social media platforms. You can also be creative by designing your own imagery to promote your salon by using online tools such as Canva. The simple tool will allow you to create promotional imagery quickly and cost effectively that can be easily shared through your social media platforms. If you are opening up your social media presence to Instagram and Twitter, it is important that your presence as a salon is accessible and easily found by the right people. Use hashtags to point out your specialism and your location. This way people looking for hair or beauty salons in a particular location will find you more easily. Ensure that you maintain your social media outlets regularly, clients are highly likely to engage with your brand through these channels, so make sure that you don’t ignore any queries. By not interacting or acknowledging messages from clients, an undesirable reputation of your brand may be formed, which in an industry relying on word of mouth leads, this is a rocky road to take. It is also sensible to maintain a regular posting schedule so that clients can see that you are able to maintain a professional online presence. You don’t have to hire a separate member of staff for this, it could be part of the duty of your front desk receptionist. It is a lengthy process to build up a relevant and engaged social media following. However, by using the power of social media to market your business, you will immerse your salon as forward thinking, dynamic and most importantly not afraid to maintain a completely client facing front. Is your hair or beauty salon race day ready?